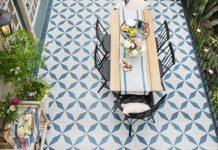 Perusing Granada Tile‘s Echo Collection of sensational concrete tiles, have you ever wondered about some of the finer points of their manufacturing? Have you wanted to find out the nitty gritty of getting custom cement tiles made? Today’s your lucky day. We’ve got plenty of great information to make you a concrete tile expert—and help you decide on the right tiles for your next kitchen tile, bathroom tile or floor tile project. To begin with, our rich, vibrant colors come not from hand-painting but from hand-pouring. In practical terms in means the color layer is thicker and will last far longer than a hand-painted tile. Our colors also don’t run. One caveat: During the installation process, when the tiles are being polished prior to sealing, the rinse water can carry a trace amount of pigment from the very top of the cement tile. However, once they’re dried and dealer, the tiles won’t release more pigment. Markzeff-designed tile made by Granada Tile covers the floors at Mercato di Vetro in West Hollywood. Granada Tile offers our clients the option of creating custom designs, colors and shapes. This leads, naturally enough, to our designs themselves. The color layer is 1/8″ thick and will not wear off. We’ve seen many antique tile installations dating back 100 years or more on our travels, and they look almost as good as new. 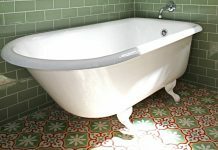 As far as creating your own custom cement tile, the standard price includes up to five colors. There’s an additional cost if you choose more. We can also match colors should you have a need. Often a client will provide and sample and our expert staff will experiment with formulas to find the closet match. Because the process is quote labor intensive, it will take somewhat longer than our usual process and the might be more costs associated with it. Hope Alexander worked with us to create cement floor tiles with subtle designs in a range of green shades for the Bedhead Pajamas shop in New York. Tile photo, Granada Tile. Our Echo Collection is brimming with designs—everything from floral to geometric, classic to contemporary and everything in between. Of course, if you want to design your own, we offer that option too. It means we’ll have to make a custom mold, aka a divisional,and that will take time and may have an additional cost. 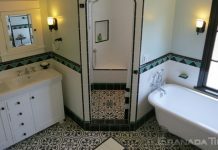 We also give clients the opportunity to create and custom size and shape cement tile design, but again, additional costs apply based on the size and complexity of the given tile design. Intrigued? See if something floats your boat using our interactive Echo Collection catalogue. If your dream floor tile design isn’t there, give us a shout, and we’ll be happy to help you create the perfect cement tile for your next tile installation project.